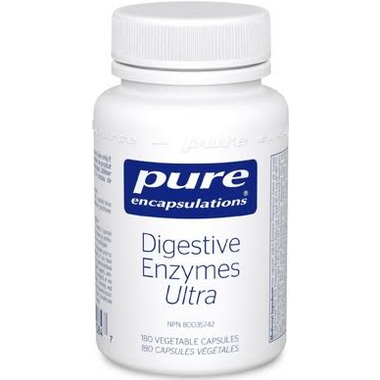 Digestive Enzymes Ultra contains an all-encompassing profile of vegetarian digestive enzymes. Proteases included in this formula provide optimal activity across a wide pH range. They facilitate the normal breakdown of proteins and di- and tri-peptides. Lipase promotes lipid breakdown while amylase and glucoamylase are included to stimulate polysaccharide breakdown of starch and glycogen. Invertase and lactase support digestion of carbohydrate disaccharides, including the dairy sugar lactose. This formula also offers numerous enzymes to support fiber breakdown, including cellulase, hemicellulase, beta-glucanase and phytase. These enzymes act to break down cell wall components and phytic acid, promoting nutrient bioavailability of fiber-containing foods. Additionally, alpha-galactosidase promotes the breakdown of certain complex carbohydrates, such as raffinose and stachyose, found in some vegetables, grains and legumes–helping to relieve occasional bloating or gas. This formula contains an all-encompassing profile of vegetarian digestive enzymes to support protein, carbohydrate, fat, fiber and dairy digestion. Proteases included in this formula provide optimal activity across a wide pH range. They facilitate the normal breakdown of proteins and di- and tri-peptides. Lipase promotes lipid breakdown while amylase and glucoamylase are included to stimulate polysaccharide breakdown of starch and glycogen. Invertase and lactase support digestion of carbohydrate disaccharides, including the dairy sugar lactose. This formula also offers numerous enzymes to support fiber breakdown, including cellulase, hemicellulase, beta-glucanase and phytase. These enzymes act to break down cell wall components and phytic acid, promoting nutrient bioavailability of fiber-containing foods. Excellent product. Really helps me with problematic digestive issues. By Far these Digestive Enzymes are the Best I've ever tried. No side effects and they worked like a Dream. I have been using this for a month and find it is a good fit for my digestive needs. Small capsules are easy to swallow and the ingredients do not create a burning sensation in my stomach like other brands have. I have no hesitation to recommend this product to family & friends. These are the best digestive enzymes :) I tried many other brands but none are working like this one. The small capsules are easy to swallow, they don't get stuck on the way down like other large capsules. I can now eat things I couldn't before. I'm also taking the Selenium and Zinc. 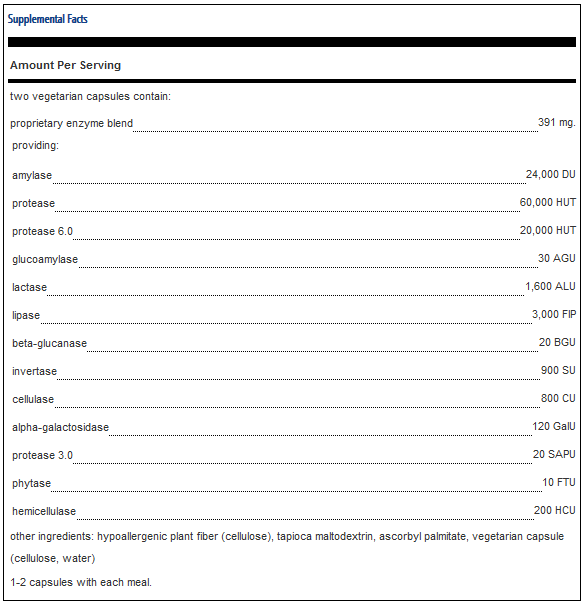 In the process of ordering the Vitamin B. I highly recommend all products from Pure Encapsulations.